RRResearch: Science Online London workshop on "Beyond Scholarly Publication"
Science Online London workshop on "Beyond Scholarly Publication"
This workshop will tie together a number of concepts raised at last January’s “Beyond the PDF” conference, looking at how we can move beyond a static PDF journal article and can redefine both our writing tools and the format of the scholarly paper. This workshop will showcase Scholarly HTML and participants will learn to use blogging tools to write content that is interesting, enriched with multimedia, collaborative, and semantically enhanced. OK, they're giving us a Wordpress blog to work on, or we can work on our own blogs (but they say that maybe some tools won't work in Blogger...) I'm trying to use the Wordpress version (the 'sandbox) but it's just hanging even though there are only about 75 people in the room. Blogger has no problem connecting, so maybe it's just this many people trying to access a single blog. I'm also not clear about what we're supposed to be doing. Writing content about Spinal Muscular Atrophy, I think. I could write about how I might use SMA as an example in my genetics class. It's excellent in many ways, because it can be presented simply as an autosomal recessive, but then I can introduce complications that lead to a more complex understanding of the relationships between genotype and phenotype. 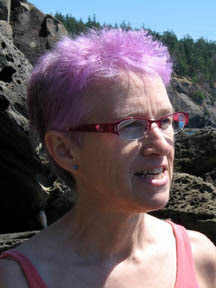 Here's an image taken from a website (yes, without permission). 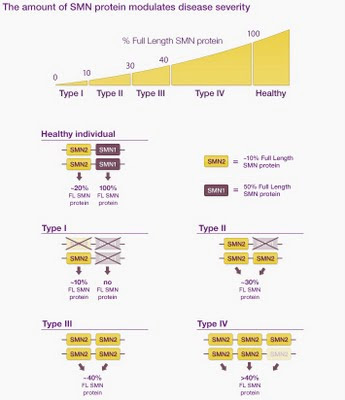 It shows how the amount of SML protein (the gene product needed for normal phenotype) depends on which alleles a person has, for two genes, SNM1 and SMN2, one of which, SMN2, is poorly expressed and may be duplicated. Unfortunately the figure is not very clear (I think it must have been prepared for a different context, one with some explanatory text). The first two genotypes are OK - the healthy individual is shown as having two functional copies of SML1 and of SML2, and the Type I as having two defective copies of SML1 and one defective and one functional copies of SML2. But the phenotypes don't make sense. 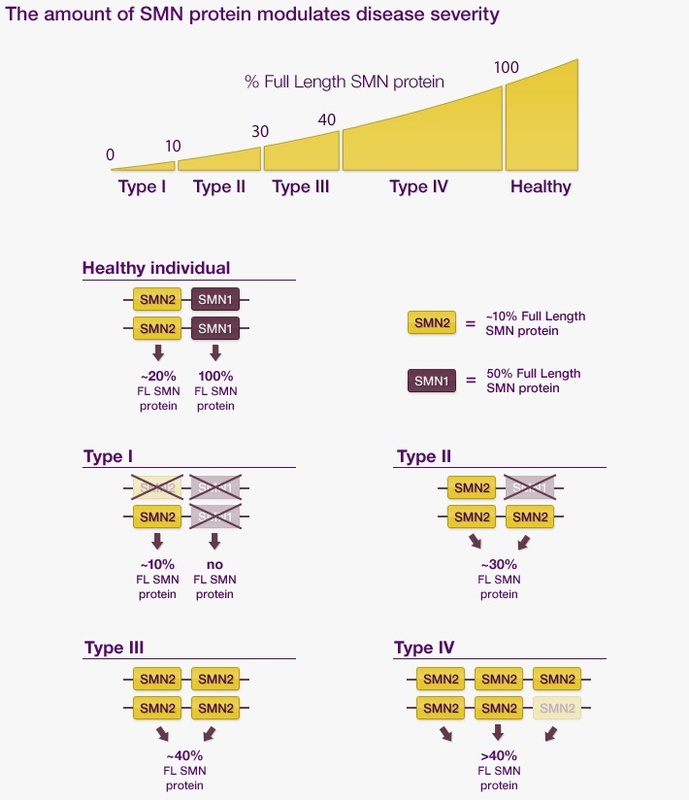 The amount of SML1 protein in a normal person is shown as 100%, but the amount of SML2 protein is shown as 20%. 100% of what, and 20% of what? If the SML1 level is 100% of normal SML1 protein, then the SML2 protein level in a normal person should be 100% too. If we instead think they might mean 100% of total (SML1 + SML2) protein, then the total SML1 protein can't be 100% because there's also a contribution from SML2 (the total would have to be 120%). It gets more confusing when we look at the Type II individual. Here the defective allele of SML1 is shown aligned with and thus allelic to a functional copy of SML2. Well, maybe this genotype arose by a gene conversion event that replaced one SML1 allele with a paralogous SML2 allele... Indeed, when I looked at a pdf about SMA genetics, written for parents, I found statements that gene conversion is frequent and that many patients have replaced one or both copies of the SML1 gene withSML2. While I've been writing this the moderator of the session has been showing us how to collect and insert a reference list into a Wordpress blog. I wasn't paying enough attention to see how he did this - he used a Wordpress plugin, but there was quite a bit of muttering about the site being slow. Now he's going to show us another plugin. e-Pub??? The text on the screen is just too small to read - he embiggened it once, but it seems to have shrunk back. He says ePub is nicer than pdfs, but I've no idea what it does or where to find the plugin. ePub is a file format used by some e-readers (notably the iBooks app on iOS devices). As a format, it's friendlier to some reading situations than PDF because an ePub reader can render text to arbitrary margins using arbitrary fonts and so on, while PDF forces a fixed page layout. On the other hand, if it's important that the reader see the document as you laid it out, PDF is definately the way to go. You can pretty much assume that anyone on earth can read a PDF, which is not the case with any of the e-book formats. A good option if you need to generate an ePub is calibre (http://www.calibre-ebook.com/) which is an open source reader/format converter. It's avaiable for Win/Mac/Linux.